"...not only demonstrate a history of innovation, they continue to push the boundaries of art in ways that help make our society more dynamic today." "Alan Fulle's well-built but pleasingly ramshackle-looking shelter installed in the corner of a meadow, made of rosy-colored construction materials, looks from a distance like a curved temple with a helicopter rotor; from inside, it turns both social and meditative." "Alan Fulle's eighth solo show since 2002 is his best"
And we visit the art packed studio (his house, actually), of Alan Fulle to talk about his new exhibit at the Traver Gallery. 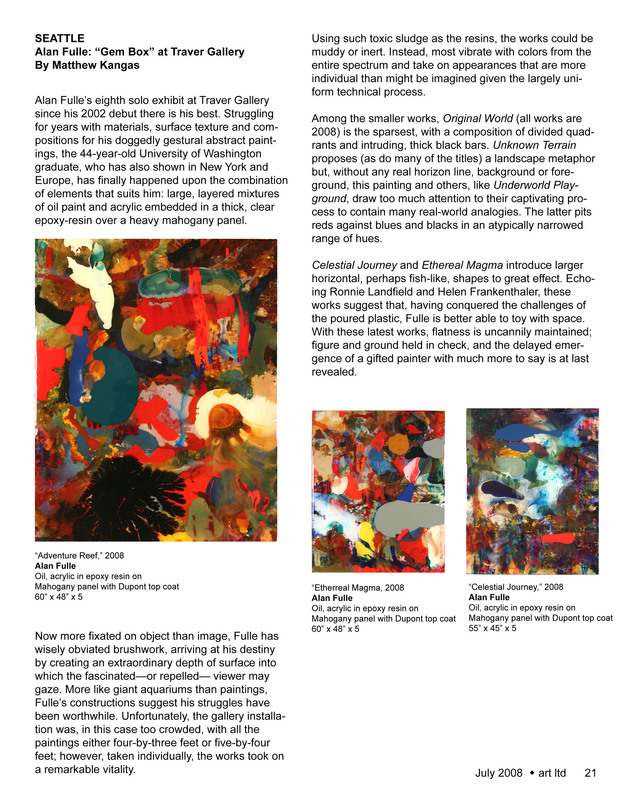 "Alan Fulle's new painting Time and Space, a grid pulsating with infinite color combinations, is a highlight." "Yours is a splendid show at The Painting Center, better than most on view in all of Chelsea. I wish you all the best." "William Traver Gallery continues to build on last month's winning lineup with the sordid yet silky paintings of Alan Fulle..."
"Alan Fulle's recent paintings from the "Light Dot" and "Simple Stripe" series continue to express, through his intense lush surfaces, a deep affinity with the painting medium. Fulle's works are grounded in the material application of paint, with luminous hues resulting from viscous layering. The images occur by reactions between fluid media like oil, enamel, resin and polyurethane. A deep physical texture is revealed, suggesting change and decay...."
"Alan Fulle doesn't have to hire anybody. His resin dot paintings blaze with colored light." "After getting an undergraduate degree in painting from the University of Washington in 1989, Seattle's Alan Fulle has been toiling away without much attention. He has used his time as an underground man to get better, becoming master of a certain kind of wrecked radiance. His abstractions look as if they've been through a lot. Call them battered but unbowed. Working in a combination of acrylics, oils, enamels, solvent washes and polyurethane resins, he produced a wonderful body of striped paintings. 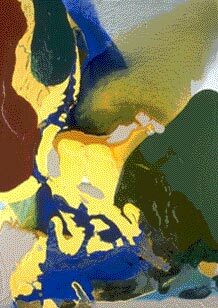 His tainted golds, bruised blues and limey greens seem to be in motion, running in transparent streams down the canvas. Plenty of artists would stop there, letting these verticals become a signature. Instead, Fulle moved on. On view at the William Traver gallery are his latest series of pattern paintings. They're engaged in an internal struggle, the patterns subverted by a suggestion of organic decay. Some bring to mind ice encasing murky ponds, life coursing under the surface. Others hint at the furtive life of a figurative image behind the pattern, degraded by the material that shapes it. You come to Fulle for vitality, not refinement. If you have a weakness for shaggy dog abstraction, he's your guy."